"We call it the mobile trades training lab. 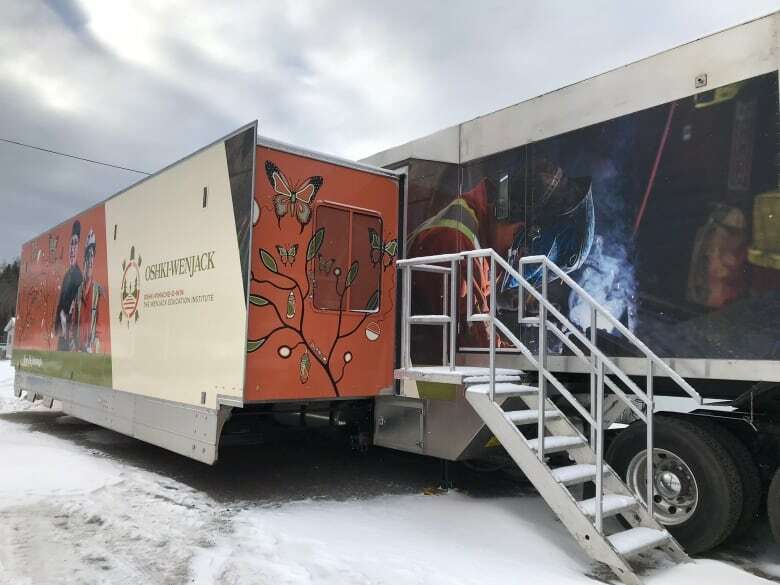 It's a 53-foot mobile trailer, it's basically a classroom on wheels [and] there's actually two trailers," innovation and training coordinator at the Oshki-Wenjack Education Institute, Gordon Kakegamic told CBC News. "The trailer [that] we're standing in is called the expandable trailer. Our second trailer is what we call our supply trailer. It transports our tools and equipment but it also doubles as a workshop trailer, so we actually have 1800 square foot of trades training space." The trailers, which will be used to offer apprenticeship training to all 49 Nishnawbe Aski Nation communities, will help ensure residents in remote communities can look after their own infrastructure. 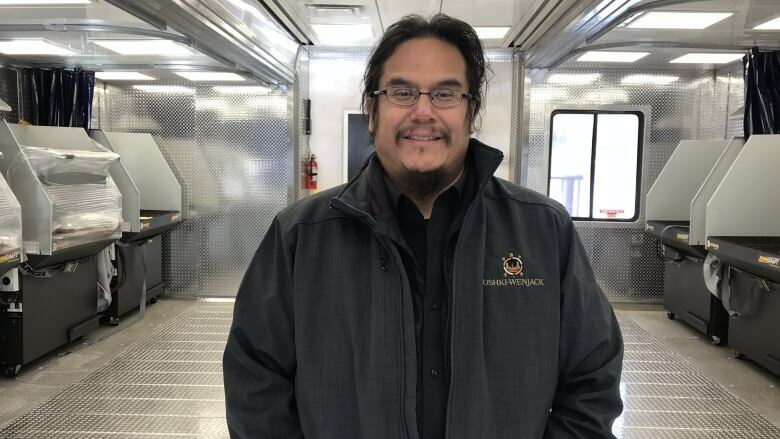 Kakegamic said he first got the idea to bring these trailers to the local First Nation education centre in 2011 when he went to visit Cambrian College in Sudbury. "We've actually leased their trailer for the Aboriginal Mining and Skilled Trades Entry program. We actually brought their trailer up to the Goldcorp Musselwhite mine to do pre-trades training for that program," Kakegamic said, adding that there's only about 20 of these trailers across the country at various schools and communities because they are fairly new. In October 2016, funding from the federal government of approximately $2.2 million was announced to help Oshki acquire their two new trailers and purchase the equipment and tools needed for training. However, according to Kakegamic, that funding only allowed them to purchase the trailers and the equipment, it did not include any operational or programming costs for these trailers. After months of trying to secure programming dollars, Kakegamic said Oshki received funding from the Skills and Partnership fund from the federal government to deliver airport management training in Pickle Lake starting in January 2019. "We actually partnered with the Ministry of Transportation and Wasaya Airways to train our community members to look after the infrastructure and the airports in our communities," Kakegamic said about the project he considers to be very exciting. The trailer will be used to deliver level one apprenticeship training for six trades: welding, carpentry, plumbing, electrical, mechanical and millwright. "Our vision overall for these trailers is really to change the trend of industry of training our people just to be helpers," Kakegamic explained, "and usually those types of jobs only last until the project is completed." He said these mobile training labs will help Oshki train Indigenous students to become mobile apprentices and journey people who are ready and willing to travel to where the work is. "Ideally, we would like to create a First Nations consortium," Kakegamic explained, "and this consortium would have some sort of database or registry of apprentices across our territory and we would welcome employers to partner ... so that when these employers have projects, we can sign up apprentices to those projects."